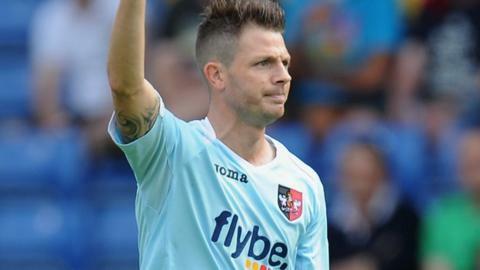 Exeter City striker Jamie Cureton says Paul Tisdale's side have what it takes to be challenging for promotion from League Two at the end of the season. The 37-year-old has scored seven times this season as City have won five of their last eight games. "I'm confident in the boys around me and I think we can do a very good job and be in amongst it for the whole season," he told BBC South West Sport. "We've had a good start and that's given us a really good platform." Despite losing their last two league games, City are still in the top five after being relegated from League One last season. The former Reading, Bristol Rovers and Norwich striker rejoined City on a permanent deal in the summer after a loan spell at the end of last season. He thinks manager Paul Tisdale has assembled a strong squad with the likes of Alan Gow,Tommy Doherty and Arron Davies joining the club. "You have to get players in, recruitment is a vital component at a club, if you don't it shows that you can struggle," he said. "We've done that and I think the manager's recruited well. "Sometimes spending a lot of money and throwing things around doesn't guarantee success, it's about spending it on the right people." And with Cureton scoring all seven of his goals in his last eight games, it appears Tisdale's decision to bring the veteran frontman back to the club was the correct one. He says a good pre-season has helped him turn around form which saw him score just twice last year, after scoring 20 the season before in his last full campaign at St James Park. "The team's been creating a lot of chances and thankfully I've been getting on the end of them and putting them away," he said. "I had a rest on the off-season and then I managed to train constantly. "I had a real good pre-season and just feel a lot fitter and hungry to go out there and do the business."